Uebelmannia is a truly unusual genus of cacti. Three species from Brazil make up the genus. These plants feature globose to cylindrical stems with distinct ribs lined with spines. The epidermis of Uebelmannia has a granular texture to it and can be a bright green, waxy-gray or even dark purple in color. The spines typically stand in contrast in bright white, golden or black coloring with areoles forming a continuous line along the ribs. These characters, while hard to describe, give the plants a most striking and unique appearance. The flowers, however, would not be considered anything special among the cactus family as they are small, little, yellow funnels which come out near the stem tip. In cultivation, Uebelmannia is considered one of the more difficult to grow. For that reason, these cacti are best left to experienced growers. They are not a good option for beginners. Uebelmannias grow in high, bright light and need hours of direct sunlight every day to thrive. They need warm temperatures. In the growing season, Uebelmannia should be kept in very hot conditions, and even in winter, they should never dip below 60°F (15°C). A low-pH soil is best and it absolutely must be well-aerated and drain well. Consider adding sand or grit to a potting mix for best results. Water regularly during the growing season from spring to summer, then water only lightly and occasionally in the winter. Feed regularly during the growing season with a balanced fertilizer like a 20-20-20 mixed into their water and diluted to half-strength. Even for cacti, these plants have a low tolerance for cold temperatures and letting them into even temperate conditions is an easy way to damage them. Make sure to keep well-watered, as well, and give them lots of light. Their roots need some space and really good drainage and keep an eye out for common pests that can damage them. Uebelmannias, however, are such rare and difficult plants that only those with lots of practice growing cacti will likely even have access to them. 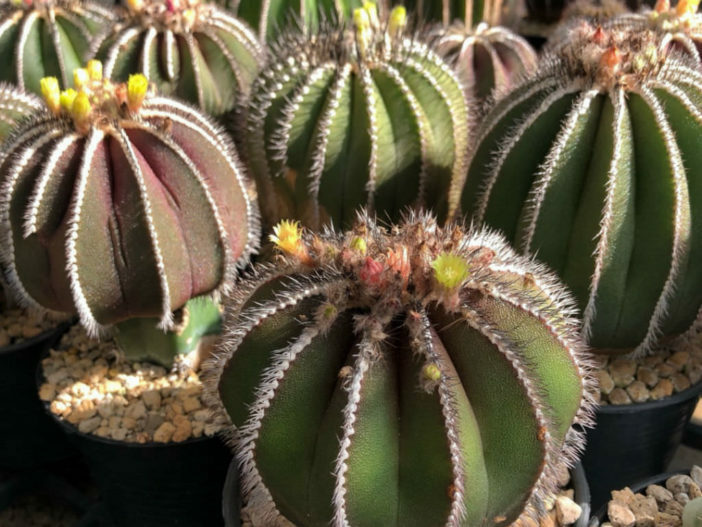 These will likely only be found in specialty shops, and their cultivation should be left to the experts, if you do cultivate one, though, they are among the most singular-looking of all cacti. If free-standing in their pots, Uebelmannias can be repotted at the beginning of each growing season by lifting the plant out as a whole and replacing in a larger container, making sure to spread the roots out in the new soil. Don’t pack them in too tightly, as this can damage their root systems and make it hard to retain water. It is quite difficult to propagate Uebelmannias. Though they can grow from seed, in common practice they are most often grafted onto another plant to help them survive.